Are you ready? 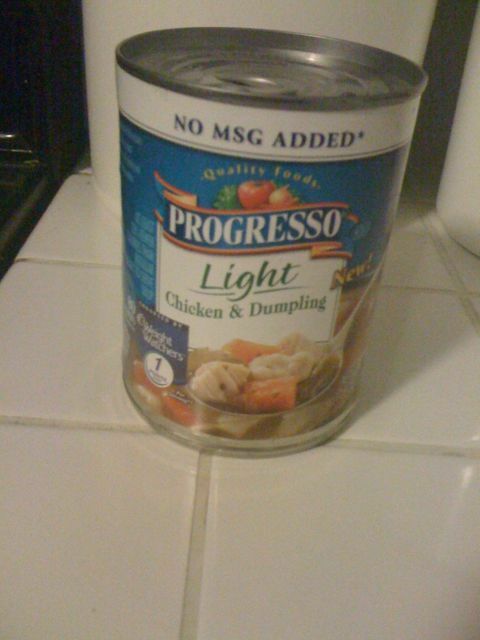 Because I’ve got Chicken n’ Dumplins warming up right now as I speak. Jealous? I do need to find something that is a bit more “breakfasty.” And to make some of my own. But I had a busy weekend eating candy–because I won’t be eating anything like that for a while into the future. By the way. I start this with a weight of 163.5 pounds. My breakfast this morning has been a can of Sprite and a bottle of V8 Vegetable Juice. I thought it was tomoato juice, but the bottle clearly said vegetable. Mike had a protein shake and brought in some chicken noodle soup he made last night. The two of you seem to be much more prepared than I am!